Christian Hackenberg threw for 4 touchdowns to lead Penn State to a comeback victory over Boston College in the Pin Stripe Bowl. When the bowl matchups were announced, I doubt many people thought “I have GOT to see Boston College and Penn State play”. However, the Pin Stripe Bowl has so far been the closest and most entertaining of any of the bowl games. Many times the best bowl games are when there are teams with contrasting styles and that was the case in this one. Boston College is a run oriented team that struggles to pass the ball, where Penn State is a passing team that struggles running the ball. Both teams had 6-6 records, and Penn State had to be fired up because this is their first bowl game since the Jerry Sandusky scandal. Both teams seemed to be feeling each other out early, with neither team able to score on their first two possessions, however, on their third possession, the Nittany Lions struck. Christian Hackenberg showed why he was the top QB recruit two years ago, when he hit freshman wide receiver Josh Baldwin for a 72 yard touchdown to get the first score of the game. Penn State tried an onside kick after the score, but the ball went out of bounds, giving the Eagles the ball in good field position. BC capitalized on the good field position by tying the game on a 49 yard run by freshman running back Jon Hilliman. Neither team scored for the rest of the first half and the teams went into halftime tied 7-7. Boston College took the 2nd half kickoff and methodically drove 60 yards in 11 plays, taking up almost half of the 3rd quarter. They scored on an 19 yard pass play from senior QB Tyler Murphy to senior receiver Shakim Phillips to take a 14-7 lead. The Nittany Lions threatened, driving to the BC 29 yard line, but Hackenberg suffered his second fumble of the game and the Eagles recovered at their own 37 yard line. Four plays later, Murphy showed why he was the #2 rushing QB in the country, when he scored on a 40 yard run to put his team up by two touchdowns. It looked like the Nittany Lions might be in trouble, but on their next possession, Hackenberg teamed up with receiver Geno Lewis on a 7 yard pass play to cut the lead to 21-14 going into the final quarter. Midway through the 4th quarter, Hackenberg hit freshman receiver DaeSean Hamilton for a 16 yard score to tie the game at 21-21. Boston College got the ball with 6:48 left and went on an 11 play, 69 yard drive. The Nittany Lions held tough inside the 5 yard line and BC had to settle for a 20 yard field goal to take a 24-21 lead with 2:10 left in the game. 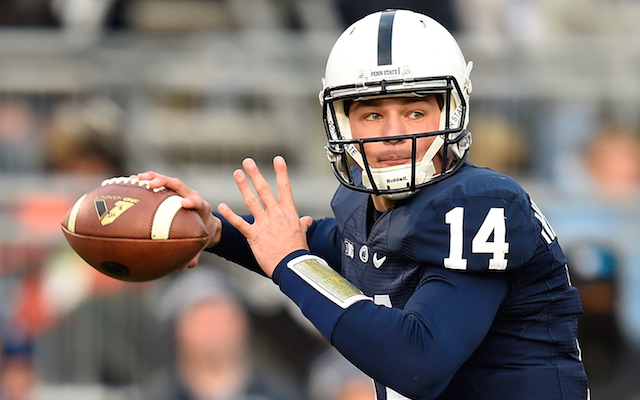 Hackenberg again showed why he was so highly regarded coming out of high school. He drove his team 49 yards on 8 plays and they connected on a 45 yard field goal with: 20 left to tie the game at 24 and send the game into overtime. Boston College got the ball first in overtime and the Lions scored quickly. Murphy hit junior running back David Dudeck on a 21 yard TD pass, but the extra point was missed, giving the Eagles a 30-24 lead. Hackenberg got his first chance in overtime and got the touchdown on a beautiful 10 yard back shoulder fade pattern to tight end Kyle Carter to tie the game at 30. Sam Ficken got the extra point and the Nittany Lions got their comeback victory 31-30 in overtime. Penn State had to be super excited to get a victory in their first bowl game since 2012. The win was just one more thing the program could build on after a tough three years. Hackenberg also proved himself to some doubters after an up and down start to his college career. He was the top QB recruit from the 2013 class, but has been inconsistent in his two years as a starter. The physical tools are there, but until this game the jury was still out on him. However, after passing for 371 yards and 4 touchdowns, Hackenberg has a big building block for the 2015 season, which will be his first year as a draft eligible player. Bill Belton, RB, Sr (5-10, 204): Steady player that lacks explosive capabilities. Has good hands and might be a good 3rd down back at the next level. Has the ability to weave through traffic, but isn’t a threat to take it all the way. Had 3 carries for 8 yards and 3 catches for 14 yards. Akeel Lynch, RB, RS Soph (6-1, 215): Led the team in 2013 with 678 rushing yards and 4 TD. Bigger back that is good between the tackles. Keeps his feet moving after contact. Good vision. Gives great effort. Drags defenders with him down the field. Good outlet receiver. Led the team with 75 rushing yards on 17 carries and had a highlight reel 35 yard run that was just short of the goal line. Had 3 catches for 12 yards. Geno Lewis, WR, RS Soph (6-1, 199): The team’s big play receiver. Has the speed to stretch defenses. Comes back well to the ball. Great concentration. Gets good yardage after the catch. Breaks tackles in the open field. Had 7 catches for 82 yards and a touchdown off of a tipped ball. Had a 32 yard catch. Jesse James, TE, Jr (6-7, 254): One of the top tight ends available for the 2015 draft. Big target with a big catch radius. Has the ability to run over defenders after the catch. Able to protect the quarterback. The knock on him is that his physicality doesn’t always match up to his body size. Had 3 catches for 27 yards. On his last catch, he ran over a defender to get a critical 1st down when his team needed to complete their comeback. Kyle Carter, TE, Jr (6-3, 241): Used more as a blocker than as a receiver. Has surprisingly soft hands and made a fantastic catch on a fade pattern to give his team the win. Competes for the ball in the air. Had 3 catches for 30 yards and the game winning TD. Angelo Mangiro, C, Jr (6-3, 309): Has played center and guard. Versatile player that was their 6th man in 2013. First year as a starter. Was called for a false start. C.J. Olaniyan, DE, Sr (6-3, 252): Good run defender. Able to put pressure on the QB. Had 4 tackles and 1 QB hurry. Anthony Zettel, DT, Jr (6-4, 274): Undersized defensive tackle that uses his athleticism to cause havoc. Led his team with 8 sacks and 17 tackles for loss in 2013. Also tied for the team lead with 3 interceptions, which is rare for an interior defensive lineman. Relentless pass rusher. Quick first step. Disruptive. Strong at the point of attack. Energizer bunny that will pursue the ball all over the field. Because of his size, he may move to the outside or possibly even a 3-4 defensive end at the next level. Whoever drafts him will find a spot for him, because pro scouts will love this guy. Had 6 tackles and 2 tackles for loss. Austin Johnson, DT, RS Soph (6-4, 313): Underrated blue collar worker. Stout run defender. Has the ability to be disruptive inside. Had 7 tackles and 1 tackle for loss. Deion Barnes, DE, Jr (6-4, 255): Long, lean body type. Has good pass rush skills and had 6 sacks on the year. Plays with good leverage. May have the body type to play 3-4 defensive end. Had 3 tackles and 1 tackle for loss. Nyeem Wartman, OLB (6-1, 236): Has the size to play inside and the speed to play outside. Good blitzer. When he hits a ball carrier, he stops in his tracks. At times can get sucked inside, giving up outside plays. Led the team with 11 tackles and had a QB pressure that led to an incompletion. Mike Hull, MLB, Sr (6-0, 232): Doesn’t have the ideal height you want for a middle linebacker, but he plays with a lot of heart. Leader of the Nittany Lion defense. Gets everyone lined up correctly. Led the Big 10 with 140 tackles. High football IQ. Does a good job filling holes and taking on ball carriers. Always around the ball. Had 6 tackles. Jordan Lucas, CB, Jr (6-0, 198): Good size for a corner. Big hitter that takes correct angles. Good blitzer off the edge. Tackles well in the open field. Had 7 tackles, 1 tackle for loss and 1 sack. Adrian Amos, S, Sr (6-0, 209): Versatile player that can play deep safety or play in the box. Tackles with good form. Had 7 tackles and was called for a personal foul. Tyler Murphy, QB, Sr (6-2, 213): #2 rushing QB in the country with 1179 rushing yards. Transfer from Florida. Dual threat, although he is a better runner than passer. At his best when he gets outside the pocket and improvises. Uses his legs to extend plays. Good speed. Finds creases in the defense. Set the ACC single season record for rushing yards by a QB. At times he can struggle with accuracy, although he had an efficient game in this bowl game. Has the ability to break tackles and make people miss in space. Completed 11 of 19 for 97 yards and 2 TD. Ran the ball 11 times for 105 yards and 1 TD. Had runs of 26 and 40 yards. Josh Bordner, WR, Sr (6-4, 230): Led the team in receiving in 2013 with 27 catches for 346 yards and 3 TD. Very good size. Good downfield blocker. Tough player that limped off in the 2nd quarter, but returned in the 3rd quarter. Only had 1 catch for 4 yards, but had a key block on the long TD run. Shakim Phillips, WR, Sr (6-3, 206): Led the team with 3 catches for 40 yards and 1 TD. Runs good routes and finds soft spots in the zone. Has good hands and has the ability to catch the ball at the highest point. Had a catch to convert a 4th and 3. Had 1 dropped ball. Bobby Vardaro, G, Sr (6-5, 299): Good movement skills. Able to pull and seal the edge on outside running plays. Bobby Gallik, C, Sr (6-3, 304): Could be in the top 5 of centers available for the 2015 draft. Second team All-ACC in 2014. Strong at the point of attack. Tough and gritty. Seals off defenders well. Can pull and get outside on sweeps. Called for a false start. Brian Mihalik, DE, Sr (6-9, 295): Led his team in 2013 with 4 ½ sacks. Big body. Good run defender. Because of his size, he may move to defensive tackle or possibly 3-4 defensive end at the next level. Had 4 tackles, 1 tackle for loss and 1 sack. Malachi Moore, DE, Jr (6-7, 274): Long body type. Knows how to rush the passer. Had 1 tackle, 1 tackle for loss and 1 sack. Josh Keyes, OLB, Sr (6-2, 223): Former safety. Good speed. Good blitzer. In 2013, led his team with 11 ½ tackles for loss and had 4 sacks to place second on the team. Had 3 tackles in this game. Steven Daniels, MLB, Jr (6-0, 257): Good size. Is all over the field and always around the ball. Plays well as a down-hill run stuffer. Had 4 tackles. Sean Sylvia, SS, Sr (6-0, 210): Has played corner and safety. Plays good deep coverage. Competes for the ball in the air. Had 2 tackles, ½ tackle for loss and 1 pass break up. Manuel Asprilla, CB, Sr (5-11,183): Good in run support. Comes up quickly to make tackles. Can get beat off the line. Was beat on 72 yard TD. Had 9 tackles. Justin Simmons, FS, Jr (6-3, 198): Great size with long arms. Able to play man coverage of receivers in the slot. Had 6 tackles, Had a tipped ball that was caught for a TD and was called for pass interference. See you next Wednesday when I will discuss the two playoff semi-final games! Should be a great week of football! If you like what you read, like us on Facebook and tell your friends. This entry was posted on December 31, 2014 by draftmaniacs in Uncategorized and tagged 2015 NFL draft, Adrian Amos, Akeel Lynch, Angelo Mangiro, Anthony Zettel, Austin Johnson, Barrett Jones, Bill Belton, Bobby Gallik, Bobby Vardaro, Boston College Eagles, Brian Mihalik, C.J. Olaniyan, Christian Hackenberg, DaeSean Hamilton, David Dudeck, Deion Barnes, Geno Lewis, Jesse James, Jordan Lucas, Josh Baldwin, Josh Bordner, Josh Keyes, Justin Simmons, Kyle Carter, Malachi Moore, Manuel Asprilla, Mike Hull, NFL, NFL Draft, Nyeem Wartman, Penn State Nittany Lions, Pin Stripe Bowl, Sean Sylvia, Shakim Phillips, Steven Daniels, Tyler Murphy.